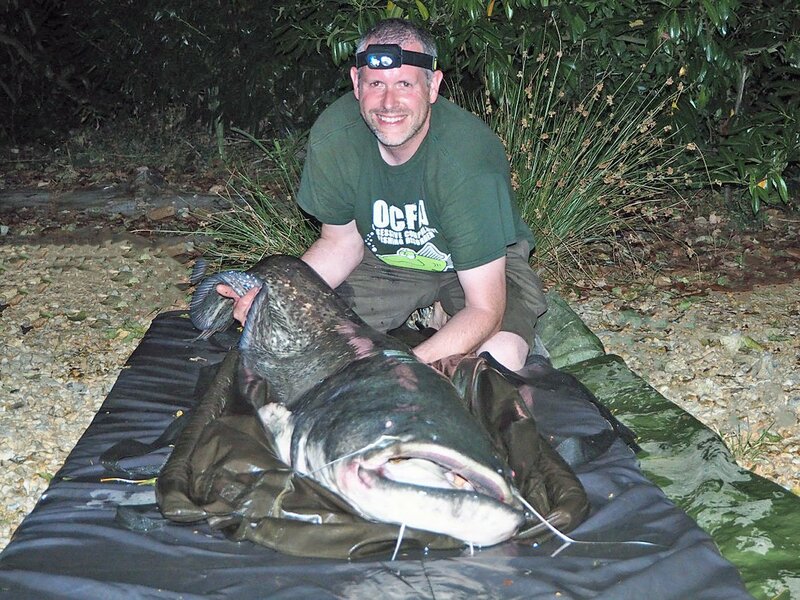 Great carp social and holiday with plenty of good specimens: 18 carp to 35lbs and a massive cat of 106lbs. This week we welcomed James, dad Graham along with good friend Mark, aka Perm. I’ve known James and Perm for a number of years so this week was as much about the social as the fishing. For Graham though this was a step into the unknown. 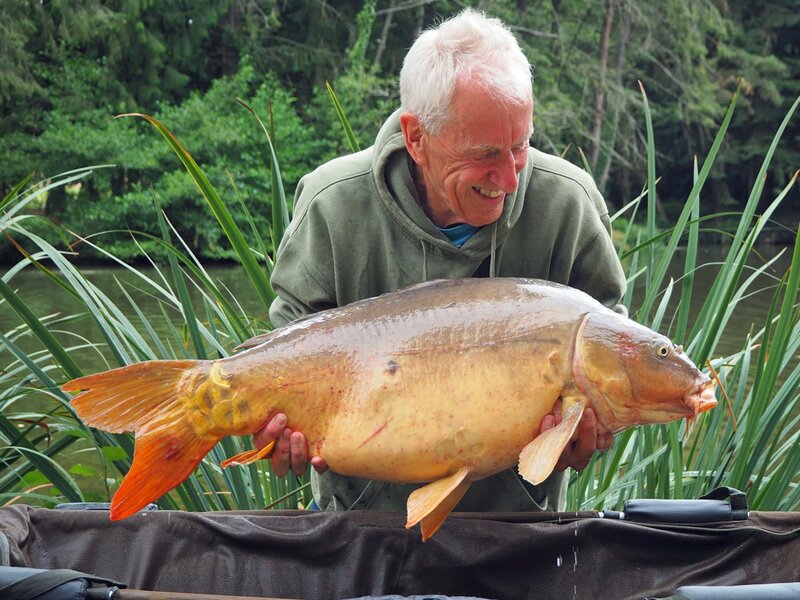 Although he’s done a bit of fishing in the past, he was new to the whole carp fishing business. 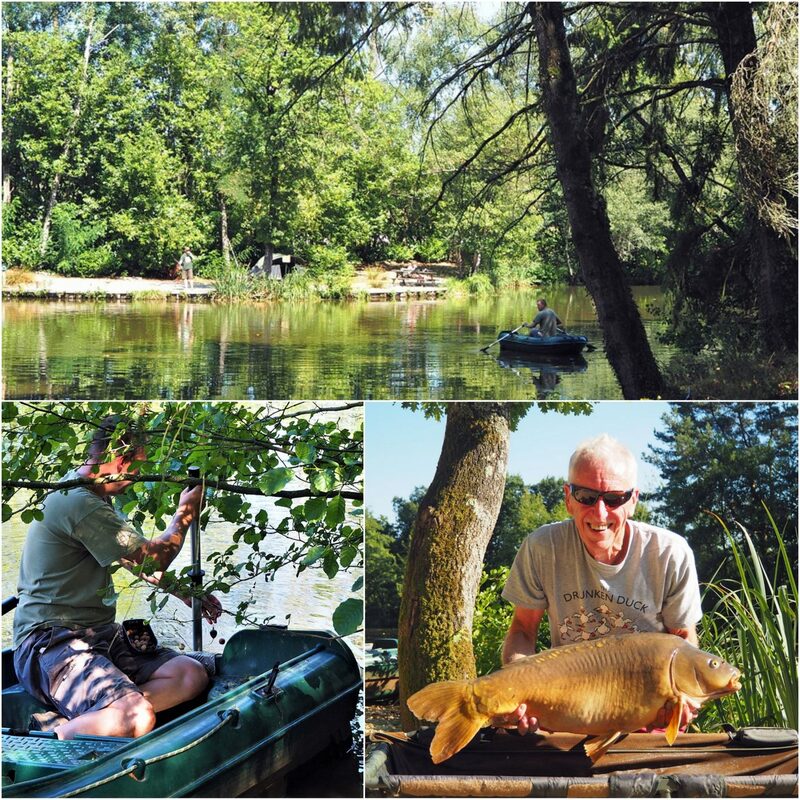 The guys had very kindly invited us to join them for their holiday on the bank for a few nights which gave me a great opportunity to study the lake properly at this time of year. The first three days were spent in sweltering heat and at night, the lake and surroundings were alive with activity. The fish were going mental in the upper layers of the lake with everything chasing everything else! It was great to see some good carp banked even in these hot and steamy conditions. Mid week, the weather changed and the lower pressure front stirred the fishing and we saw 7 nice carp on Thursday alone. James and his dad set up camp in the Point swims so that they could enjoy the week together. On Sunday, we put a plan together for Graham who was going to target the shallows. Rigs sorted, I rowed Graham’s first rig out to the newly named Peter’s Point which is on the island margin. Last week it produced 7 nice carp so it was an easy choice. His 2nd rod went just over the back of the aerator bar. Less than two hours later, Graham was into his first carp and at just under 25lbs he was well pleased with this whole carp fishing business! This new spot produced 4 more fish this week which was great to see! James is no stranger to our big cats but he’d never broken the three digit mark and was as keen as mustard to meet a proper monster! On Sunday night his prayers were answered by a very angry catfish hooked from a spot parallel to snake bank. I got my chesties on and climbed into the margin as I wanted to have a go at sliding it straight into our new catfish weighing sling directly. The plan worked very well and it was pretty easy to guide it straight in without unzipping the ends. Once secured and with the catfish mat positioned right next to the fish, it was a three man lift with me in the middle in the water and James and Graham at each end to raise him onto the mat. 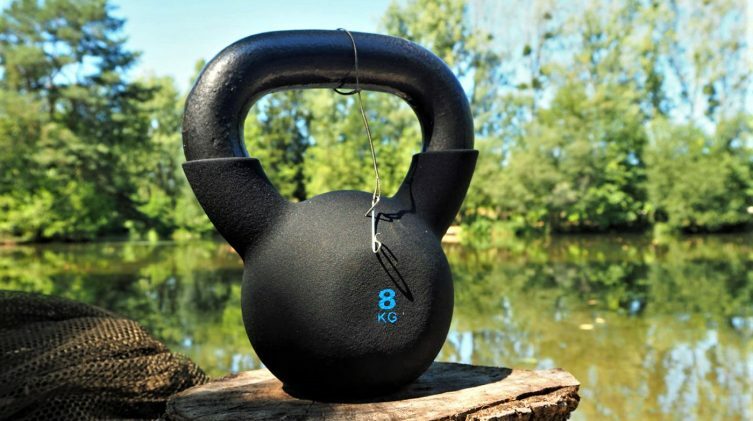 On the scales, it span round to 114lbs minus 8 lbs for the sling, so 106lbs it is… bit bigger than you originally thought mate! James and Graham then banked carp after carp from the Point swims using classic Beausoleil tactics (bait boat traps of boilies and pellets) and a new simple mono rig that I’ve been experimenting with. For the most part they stuck with our 24mm bottom baits but they also had some on 2 x 20mm bottom baits. James is a dab hand at the old hook sharpening lark and managed to make a pack of 10 hooks last the whole session despite them taking a beating every night. The guys had brought their own baits with them. The nut mix was nice and crumbed easily between the fingers but it was no match for our roach and the baits were destroyed within a matter of hours. The fish meal fared better as it had been rolled specifically for the venue. 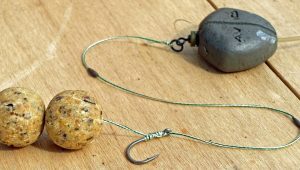 Baits were very tough and even after a very hard squeeze could barely be split in two. They were more like miniature squash balls in consistency and I know most carpers would be horrified by them. They were perfect! In fact based on my own experiences this session, I’ll be upping the cook times for both the 20mm and the 24mm for the rest of the season as the roach are more like piranha than innocent silver fish! 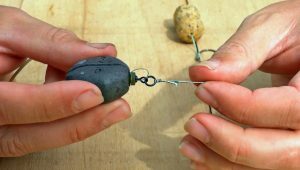 If you bring your own bait, make sure the whole mix is very tough! Friday morning, things kicked off again for Graham but the sleep deprivation was catching up with him so James hit the first run of the morning. All was going smoothly when Graham’s other rod went! “It’s no good dad you’re going to have to help me out here!”. So, that’s another two carp then! Click here to see all the fish from the session. Graham’s skills came on leaps and bounds and it was great to watch James coach his dad through everything from fish playing to carp holding. By the end of the week, Graham was really looking like a proper carper, complete with the green hoodie he borrowed from James! He loved the whole experience and might even be tempted to do it again! After many highly successful sessions in Island point in the past, it was Perm’s first port of call on arrival. However, it was soon head scratching time as he just couldn’t buy a bite. After three nights of listening to lump after lump haul itself out in front of home swim he’d had enough and on first light he was on the move. Home swim is very under fished. I’m not sure quite why as it’s closest to the house but it does have two major problems, namely the bridge and the aerator. It’s also shallow, and very spotty. A casual fling of the lead reveals heavy silt and chod which are never a favourite among carpers. The carp feel very at home in the warm shallow water and will happily spend a lot of time here during the summer. 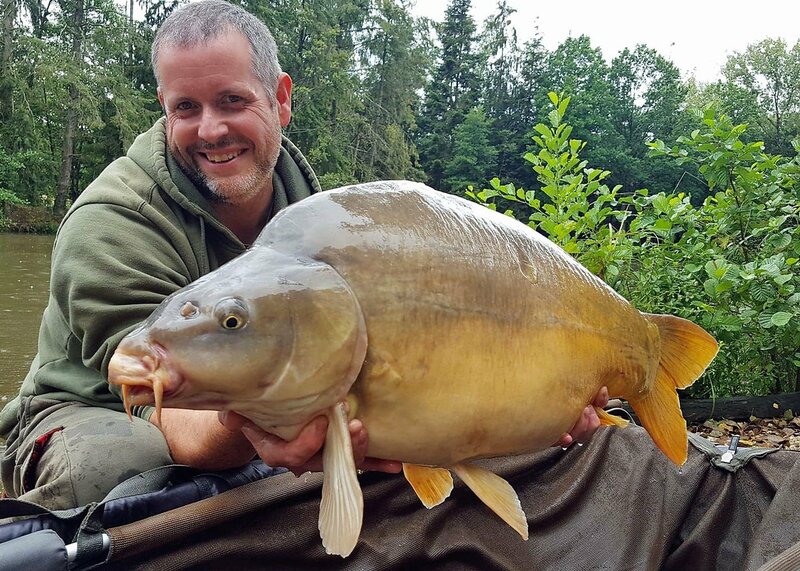 A more detailed survey reveals a treasure trove of hidden rocks, bars, gullies and holes (which the carp have excavated) hidden amongst the silt and chod. The only way to fish it properly is by dropping rigs from the boat. Don’t worry about spooking the carp in the shallow water, it doesn’t bother them at all! 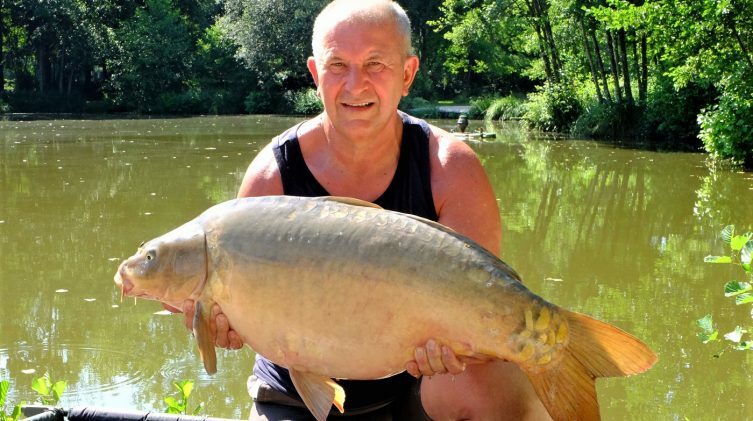 I already had three spots in mind for Perm and literally ten minutes after dropping one off by hand, Perm was into his first carp of the session. 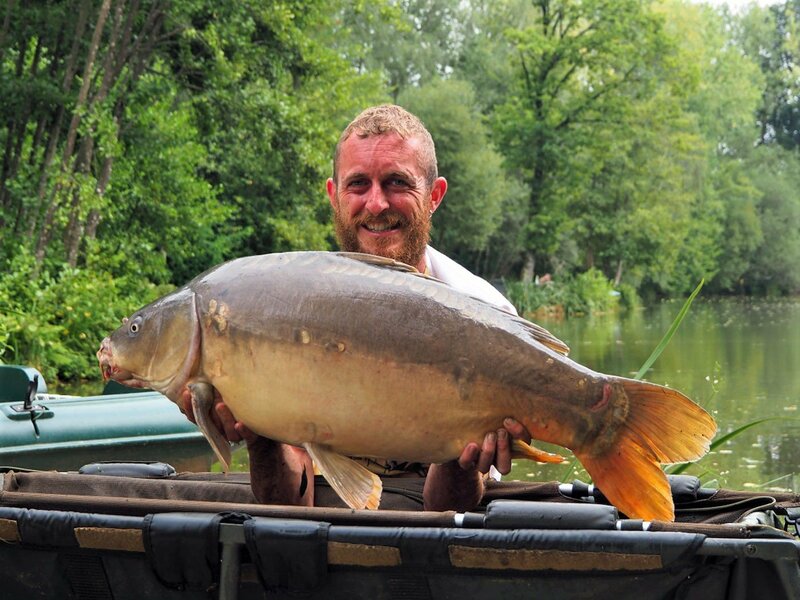 Combining his superb watercraft skills with his own tweak of the Beausoleil rig, he then went on to bank 4 in 24hours. Classic Perm! After two nights of nothing but kittens and massive liners in the Big Double I was on the move too. The carp were happily boshing out in front of me but I just couldn’t get a pickup. With a few more positive signs of fish activity now showing along the island margin, it was about the only move I could make that could change my fortunes and save a blank. On my first night the carp were rocking their socks off under the fir tree but all I managed were a few furtive lifts of the bobbin which then fell silent for the rest of the night. Again I had two rods wiped out by massive liners and that was it. By morning the only rod in the water was the one under the fir tree and on wind in the hook had been smashed to pieces. 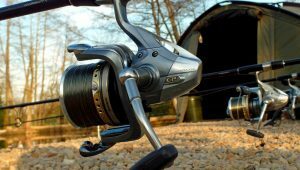 It literally looked like a grappling iron… I was fishing the same rigs as James and Graham who were smashing it in the Point swims but I just couldn’t manage a proper take no matter what I did. It was as though I’d forgotten how to catch a carp for myself. 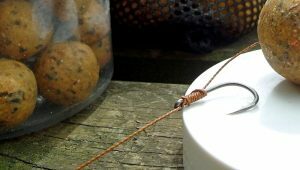 It was time to return to what I know works best: sharp hooks and 2 x 20mm bottom baits on a supple braided rig. 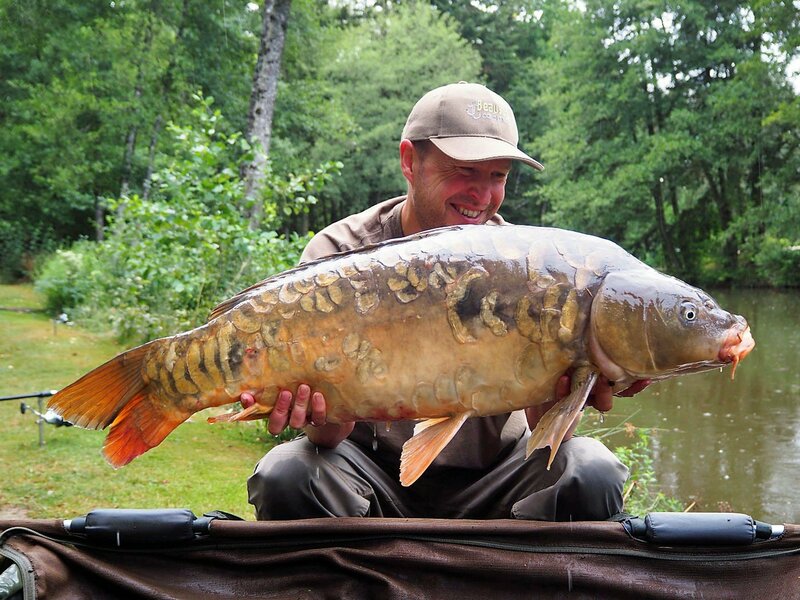 Find a carp, get the rig in place on something firm and dot some baits over the top… the result? A scaly upper twenty within a hour! My god I drive myself bats sometimes. Keep it simple stupid! 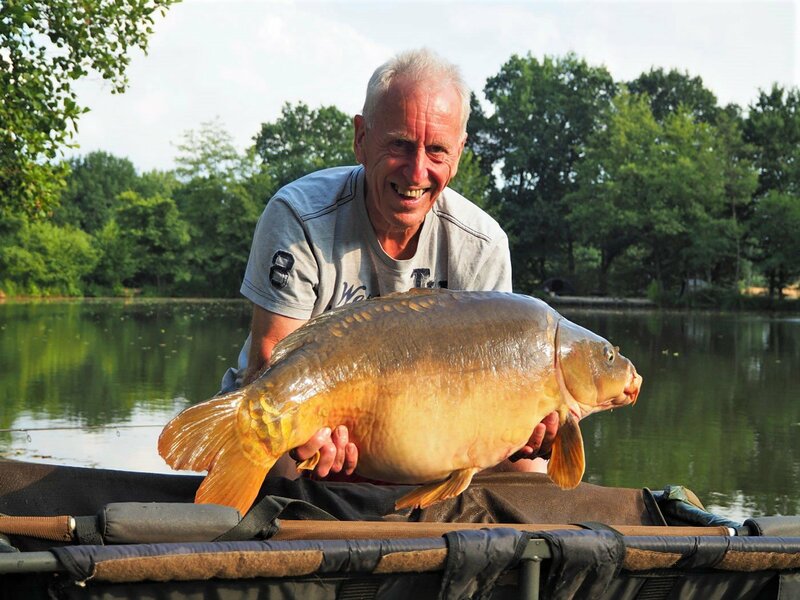 For me the session was absolutely fascinating and despite only managing the one fish it didn’t matter a jot to me. This is what carp fishing should be about. 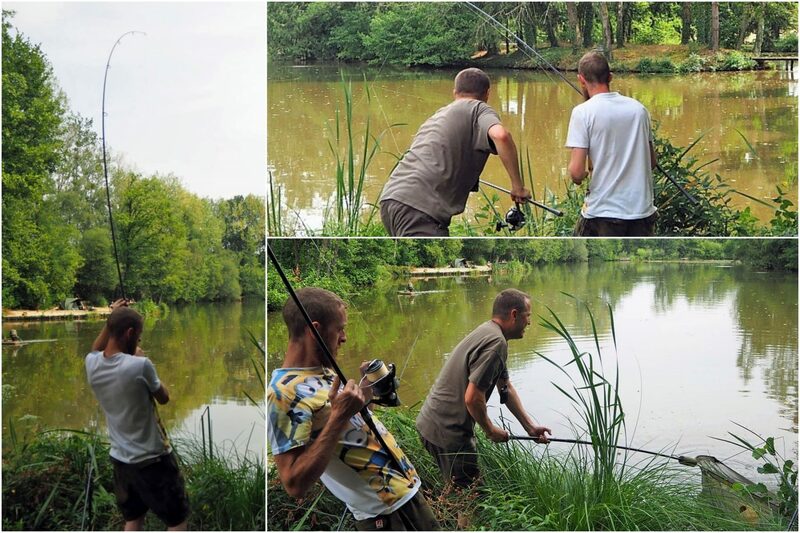 Chasing carp with good friends and if you’re lucky, catching one! The boys fished hard through the last afternoon and night before winding in on Saturday morning. All too soon the party was over and it was back to reality for our friends. It was fab to see them and we can’t wait to welcome them back again for more fishy adventures!